Healthcare providers at Providence know that a healthy person also needs access to housing and food stability. But for the approximately 15% of Oregonians living in poverty, that access is threatened, especially when facing an emergency. When doctors and nurses identify an issue they can’t resolve—for example, discovering a patient runs out of food each month—they refer the patient to Impact NW’s Community Resource Desk. There, a resource specialist, such as Carmen Diaz, works with clients to create a customized action plan to ensure they receive care for additional aspects of their life. As a previous client of the desk herself, Carmen was happy to return as a volunteer. “If you’re not stable in your life, you start getting health issues,” says Carmen. Volunteers like Carmen meet with community members such as local seniors Ana and Alex. After the winter ice storm, Ana and her spouse found themselves struggling to cover their increased heating costs. Already behind on their electric bill, they didn’t have anything extra to cover the cost. In another case, Alex was asked by his doctor to supplement his diet with protein shakes while he underwent dialysis after a recent stroke. He had no extra room in his budget for the supplements and had to choose between his health or paying his essential bills. 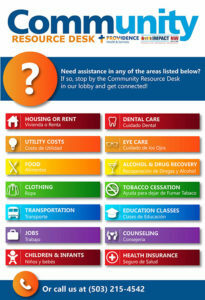 Services offered at Impact NW’s Community Resource Desk, located at several Providence locations in the Portland metro area. 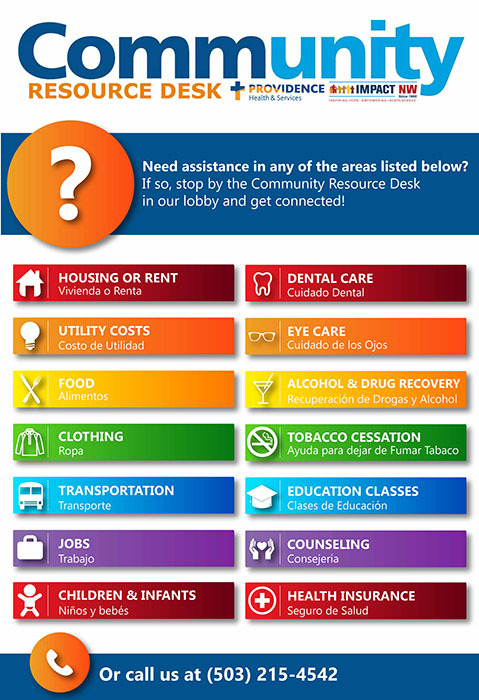 Of the approximately 100 to 120 people referred to the desk each month, the majority of them need health insurance resources, followed by housing and food assistance. “I don’t want to put a Band-Aid on something; that will come off,” Diana Marquez, program manager for the desk, explains, so clients are empowered to learn how to how to fill out forms and apply for themselves. “We do a lot of education,” Diana says. For Ana, the action plan she developed with the Community Resource Desk helped her find several resources that she didn’t know she had access to. The desk staff discovered she was eligible for Meals on Wheels in addition to help paying her electric bill. In the end, Ana received enough help to cover her bills, and to begin to pay off her overdue electric balance. Locating protein supplements for Alex took some more problem solving. The resource specialist called everywhere from food pantries to gyms, with no luck. Finally they located a doctor who was receiving free samples of Ensure and who was happy to pass the unwanted product to Alex. This solution helped Alex stay healthy, and would not have been accessible without the creativity and connections of the volunteers at the resource desk.